"must be very poorly motivated"
✅ Trip Verified | Very specific comment about e-Passport lanes. The airport was not busy (at 1620) and there were about 5 people at each e-Passport lane. two supervisors/lane marshals (not too sure what their role is!) - Four of the lanes starting building up, and the lady supervisor did nothing - people asked if there was a problem - she ignored them - she then clambered up on the gates to have a look at the operators (I assume they look at screen match passports and open the gate) - one guy was working normally (I got through easily one of his lanes), but to the left there was clearly a problem - two operators were having a bit of a domestic, I think regarding changeover. Once this was resolved the new operator ignored her work and continued to complain the the guy operating normally who ignored her and carried on. People, including me, were congregating on the land side of the gates waiting for partners family members caught by the standstill. No member of the public was getting angry just enquiries as to whether there was an issue, and to let the people stuck know and move them to other queues. The supervisor started shouting at passengers, ignoring the situation at hand, and did absolutely nothing to resolve the situation. The operator causing the hold up eventually (more than 5 minutes later) turned back to her screen and started work. The passengers had mostly moved to other queues. The point of my complaint - I felt sorry and embarrassed for the staff - they clearly have no leadership or training in how to manage situations - this was not a problem of lack of resource or too many passengers, just a straightforward failure of people to do their jobs in wholly normal circumstances - they created the problem For that to happen they must be very poorly motivated, trained and led - that can and should be addressed. "Horrendous from start to finish"
Not Verified | Horrendous from start to finish out and in bound. Dirty floors, poor choice food and drink for size and traffic of it. Worst bit was the wait time at security and passport control on way back in. See the picture. It is unbelievably bad. Poor for kids in particular. Staff didn't seem overly happy bunch. Grossly understaffed and clearly lacking leadership. Worst airport experience ever in both UK and overseas by a mile. And I've been to some bad ones. Avoid. It's just not worth it. I will never use again. Life is too short to tolerate this sort of experience. ✅ Trip Verified | I have made a solemn vow never to travel through this airport again. Arrived in plenty of time, about an hour and a bit before the flight, had fast track pass. Thought I was all sorted. Little did I know that they had two octogenarian security staff (hey, I’m all for equal opportunities but) who were swabbing over 50% of what was passing through the scanners. So after a thirty minute wait (in fast track!) finally it is my turn to have my bag swabbed. Painful to watch, in same way their arthritis must be painful. After running through the airport at top speed (very slow, since the airport is hopelessly overcrowded and the shops are an actual assault course) then waiting for the shuttle (very irregular and slow) I am pleased to say I made it as the last person on the plane. Oh but of course my bag had to go in the hold, but not a disaster as such. "No staff in area explaining"
✅ Trip Verified | Arrived 7th March at Stansted., 23:30hrs from Tenerife. Big build up at service trains to take from runway area to Baggage recall. First view was a stuck message board saying train due in 2 minutes. That 2 minutes never changed. Coming down the escalator there was a backup queue of people at least 10 deep. Almost no room to leave the escalator. Waited. No train. No change in sign information. No staff in area explaining. Then a Tannoy. 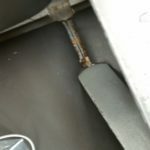 Train problems. These took about 20 mins to resolve before I shoe-horned onto one, whilst waiting queue pushers resulted in a baby pushed over. Foul language and arguments arose from it. Again no staff. CCTV would have been able to see and react to the chaos but no-one was sent. No information messages relayed either. This resulted in numerous arrival planes backing up behind us, which meant the epassport area was grid-locked. Hardly any staff. 30 epassport booths, only 8 open. Rude staff at epassports. Welcome to Stansted. This is not my first bad experience of Stansted. Shambles describes it. ✅ Trip Verified | Absolutely appalling. 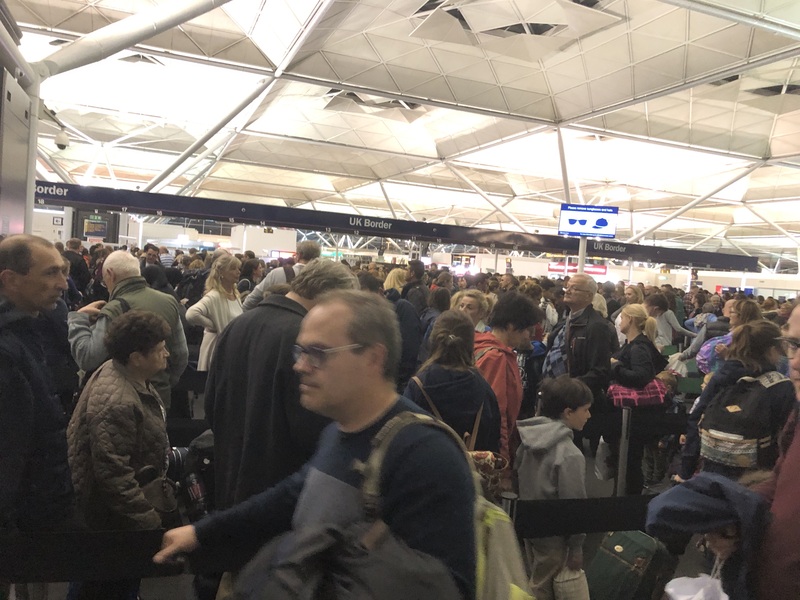 We arrived at Stansted airport at 11:30pm on Saturday 2nd March 2019. It took us 2 hrs to get through passport control! On arrival we were told that our family of 4, all UK passport holders could not go through the UK passport holders gate and had to join the queue experiencing a supposed 50+ mins wait as our children were under 12 yes old. We were traveling with an 11month old baby and 5 year old. We complained to the staff and Border Control who were rude. When I explained that I had to carry a baby for what turned out to be 2hrs as we queued I was told 'thats not my problem and that I should have bought a buggy'! I explained I did have a buggy and that we had to check it in and would be on the baggage carrasol. When my husband complained to Border Control, the staff member was aggressive and extremely rude. 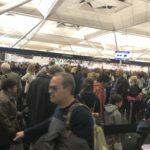 We have no problems with queuing but the staff did not manage the queue with people jumping in, there was a lack of information on how long it would take to get through passport control, the signs said 50mins, it took us nearly 2hrs! There was no water or seating available for older or younger passengers. Reading reviews this not the first time this is happened. The frustration comes as with better queue management this could have been so easily rectified. Out of 30 desks, having 15 opened for families with children, 10 open to able adults and 5 specific desks for 60+ who aren't disabled as there is a specific gate, but people who may struggle standing for 2 hrs, would have, I'm sure got people through a lot quicker rather than one massive long queue. Such poor management, service and experience and the most disappointing thing is reading reviews where this has happened before and I'm sure it will happen again as it seems a poorly managed, archaic airport. "as awful as we expected"
✅ Trip Verified | The experience on the way out of the country wasn't too bad, but then it was only 06:00. 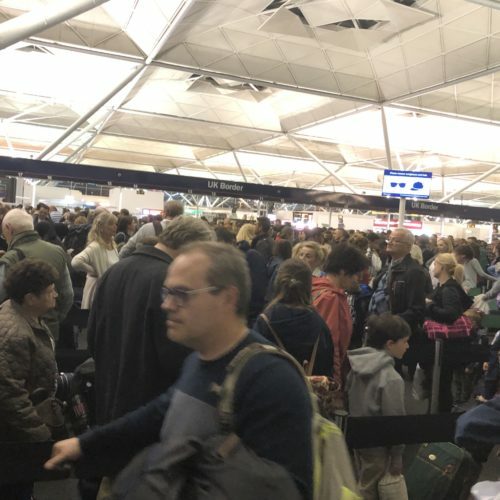 Returning to Stansted was as awful as we expected and took over an hour to get through the airport without luggage to claim. 6 out of 30 e-passport booths open and 1 of those appeared faulty. An absolute joke. Getting through border control at Stansted takes longer than some of the flights. Not Verified | Awful experience, as airports go if you have been travelling and are tired, expect little respite while waiting for your flight. Everything at Stansted is designed to make you uncomfortable and deny you rest. If you dare to slouch against a wall and close your eyes, a dedicated task force will wake you up every 10 minutes. 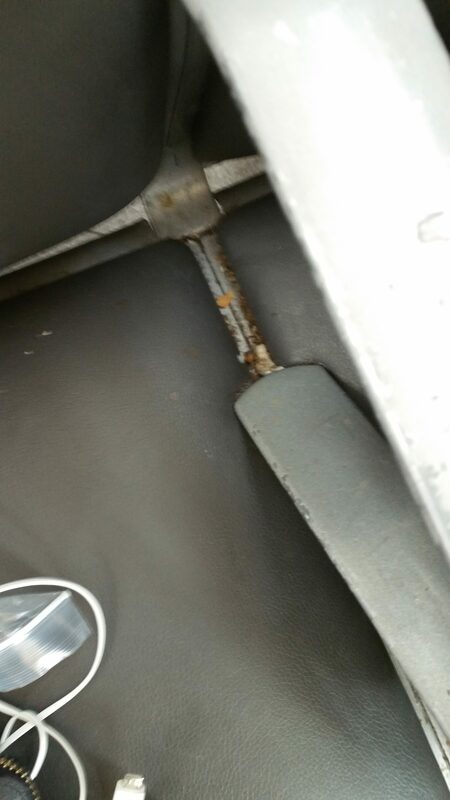 Seating in the escape lounge is no more comfortable. No charging sockets, so don't dare use your phone with electronic boarding pass on it to pass the hours and break the monotony. Utterly dire, makes the flying experience akin to a trip to Abu Graib. "it was super well organised"
✅ Trip Verified | When we came into the airport it was super well organised and knew well where to go. The security was really quick and also organised. After that we didn't have much time to do much but there was no problems. In contrast when we arrived the queue's were very long. 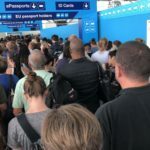 "Everything is a rip off"
✅ Trip Verified | I had not travelled through Stansted airport for 15 years. It not easy to get to from South London and I resent paying £40 in trains fares however an extremely cheap airfare encouraged me to take the risk. Everything is a rip off. In all my years I have never seen a weighing machine in the check in zones with a coin slot which charges you just to weigh your bag! A bottle of water at WHSmith cost £2 please avoid and a Jack Daniels 70cl cost £25 in duty free. How is that a duty free price when it costs £18 in outside shops? Heathrow and Gatwick a much better experience. Its a such a shame that the low cost airlines cannot get slots in Gatwick which as usual is down to the shortsightedness in UK goverments and not supporting airport growth. It was not this bad when BAA owned this site avoid if you can this airport does everything to rip you off. Not Verified | First - the car park is very expensive so I always use drop off/pick up point. This is very expensive too - £3.50 for 10 min drive through, so departure and arrival makes £7 for 'pleasure' to wait in rain and wind because drop off area has no canopy. It is not marked either at all in arrivals hall, like it would not exist. My flight was allocated to far gates number 50+. I went to toilet nearest to the gate and no one sink in the ladies toilet was working! So we all been left with hands covered with soap, forced to dry them in dryer or just walk away. After latest changes in the lounge there is even less seats and I even don't want to think how people will manage in the summer when is a peak time for holiday. 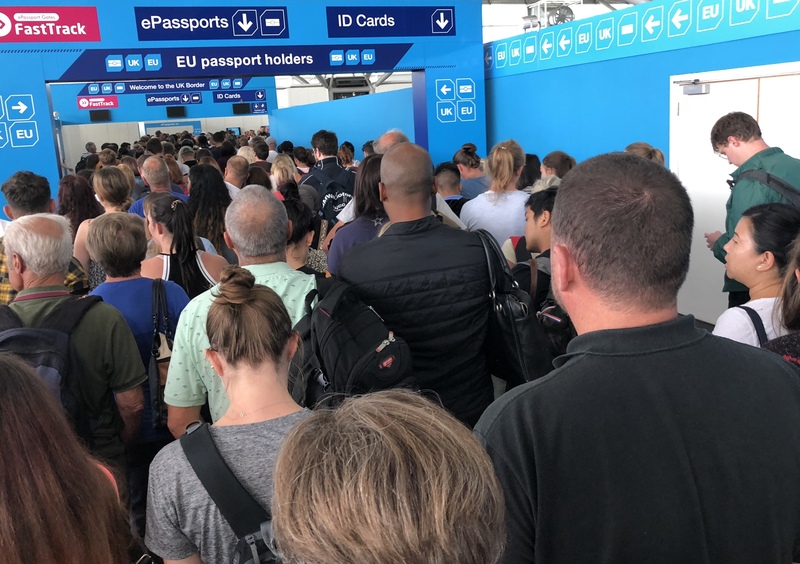 I do not recommend London Stansted Airport at all and if you have a choice use different one.